“This achievement is a reflection of our magnificent team of LIVEbe Ambassadors, whose exceptional service levels attracted new members at a lightning-fast pace,” said Jayme Martin, community director of LIVEbe. LIVEbe, a premier apartment developer and operator, today announced that The Remy, a 278-unit midrise apartment community in Lanham, Md., has earned a Delta Associates Excellence Award in the category of Best Lease-Up Pace for a Suburban Maryland Apartment Community. 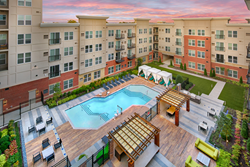 The Remy, which began leasing in 2017 in the emerging Harkins District of Prince George’s County, was able to reach lease-up in one year and has averaged 23 move-ins in its first 12 months. Delta Associates used a 10-month metric and recognized an average of 19 move-ins en route to stabilization. LIVEbe was presented with the award on Oct. 17 at the Delta Associates’ 22nd Annual Apartment and Condominium Industry Awards for Excellence, a private cocktail event on the rooftop of the 880 P apartments in Washington, D.C.
LIVEbe has created a unique culture, part of which includes referring to its team members as Ambassadors and residents as members. The company’s focus on resident service recently resulted in numerous 2017 SatisFacts Resident Satisfaction awards, which included one for The Remy. The community received a nearly perfect average survey score of 4.93. Situated at 7730 Harkins Road, The Remy features immediate access to the New Carrollton Station, which provides access to Baltimore, Washington, D.C., New York and Pennsylvania via Amtrak and Metrorail. Shortly after opening, The Remy ambassadors and members collected donations and engaged in an area cleanup effort to help brings a sense of community to the Harkins District. The Remy consists of studio, one- and two-bedroom apartment homes and features a rooftop lounge, hydrotherapeutic saltwater pool, outdoor grills, relaxing courtyards, dog run, pet spa, state-of-the-art fitness center with yoga studio, game room, movie-screening room, gamers gallery and telecommuting spaces. Apartment interiors include stainless-steel appliances, quartz countertops, in-unit washers and dryers, double-pane windows, hardwood flooring, walk-in closets and designer lighting and hardware. A design of Phase II is underway with construction to follow. The second phase will add more than 200 additional apartment homes, and retail space within the buildings. The Delta Associates’ Multifamily Practice Group annually issues awards to recognize outstanding multifamily accomplishments in the Washington, D.C./Baltimore area. Headquartered in Rockville, Md., LIVEbe was founded in 2016 and is helmed by multifamily veterans Elaine De Lude and Jennifer Rucker. LIVEbe is the multifamily division of Berman Enterprises and was established with a specific focus on fostering a sense of community by offering an unparalleled living experience for residents and employing LIVEbe Ambassadors who are forward thinking and passionate about providing exceptional customer service. Berman Enterprises is a multi-generational real estate and investment company founded on the principles of honesty, integrity, hard work, hands-on management, community and philanthropy. Employing a conservative financial strategy, Berman Enterprises has experienced sustained growth since brothers Melvin J. Berman and I. Wolford Berman founded the company in 1952. Today, the Company and its affiliates own and manage more than 9 million square feet of commercial office, retail, industrial/flex and residential properties in Maryland, Virginia, Illinois, North Carolina and Pennsylvania. The Company also owns several hundred acres of developable land representing thousands of units of residential and hundreds of thousands of square feet of commercial and retail development potential.